We recently picked up the book Snowballs by Lois Ehlert (affiliate) at the library. It is a simple story about building a snowman family after it snows and the different types of objects you can use to decorate your snowman. It was a fitting book for us since we’ve had tons of snow lately and my kids recently made a snowman with their Aunt Krista. Even though the book was about building snowmen, I couldn’t help but fall in love with Lois Ehlert’s beautiful illustrations in the beginning of the story. 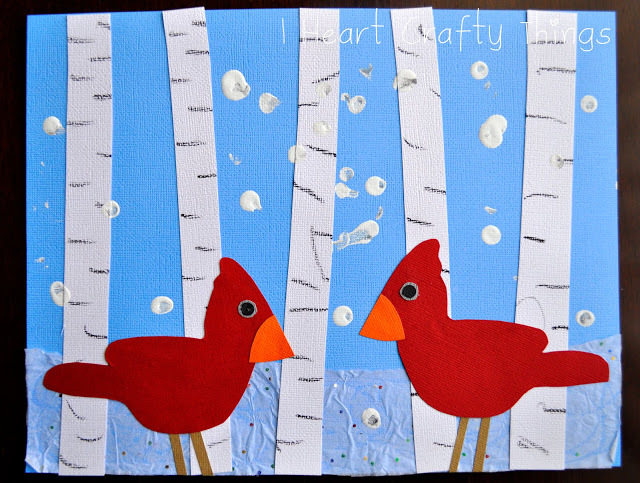 I love aspen trees and coupling them with snow and beautiful birds seemed like a perfect craft. 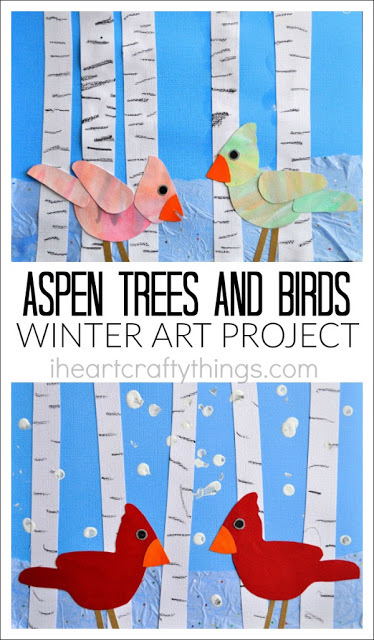 We are excited to share our aspen tree and birds winter art project with you today! 1. 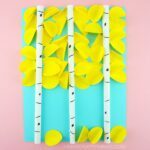 Start by cutting out strips of white cardstock paper for your aspen trees and use a black crayon to mimic the lines in the trees. Then glue them to your light gray or light blue cardstock paper. 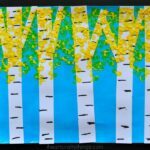 If you’d like, you can also glue down some glitter white tissue paper at the bottom of your paper, behind your aspen tree, so it looks like a layer of snow. 2. Print out the bird pattern. 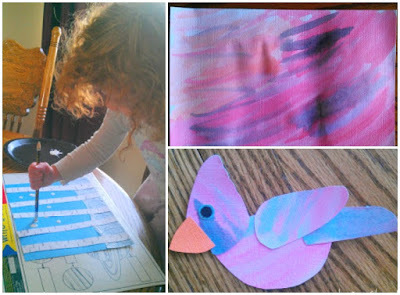 You can either make your bird a solid color like our red bird, or you can make a colorful watercolor bird. 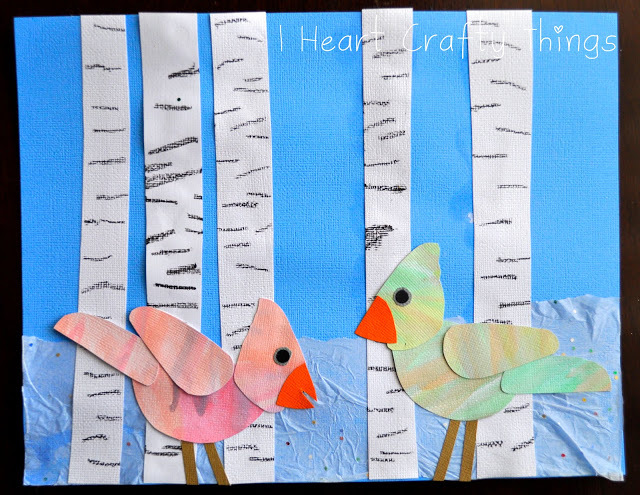 For the watercolor bird, paint an entire sheet of white cardstock paper with your watercolors. When your watercolors have dried trace the bird pattern pieces onto the back of your paper and then cut them out. Glue all the pieces together to make your birds. 3. Cut a beak and legs out of your orange and brown cardstock paper. Glue your birds onto your aspen tree art, together with the beak and legs. 4. 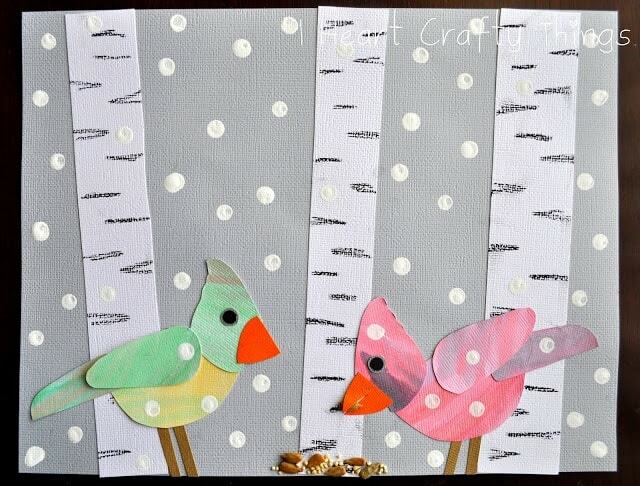 Cut circle eyes out of your gray and black cardstock paper and glue them onto your bird. You could also use googly eyes. 5. If you’d like to mimic the book, you can glue bird seed at the bottom of your paper and even inside the birds mouth. 6. To finish the project, dip the eraser on the end of a pencil in white paint and dab it onto our paper to make the snow. As you can see in the picture, my toddler LOVED this part! You could also leave your artwork without the snow printed on. OH, this is so cute!! I love it!! Rachel, these are absolutely gorgeous!! I love how you use so many different techniques in all your crafts, I can just imagine the fun that goes on in your home! I hope you are all feeling healthy and happy!! 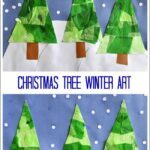 Love this and will have to try this with all of our winter crafts. 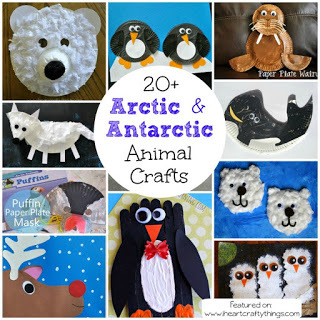 This craft is wonderful! I love the watercolors and how the kids can really get into it. Such pretty artwork! 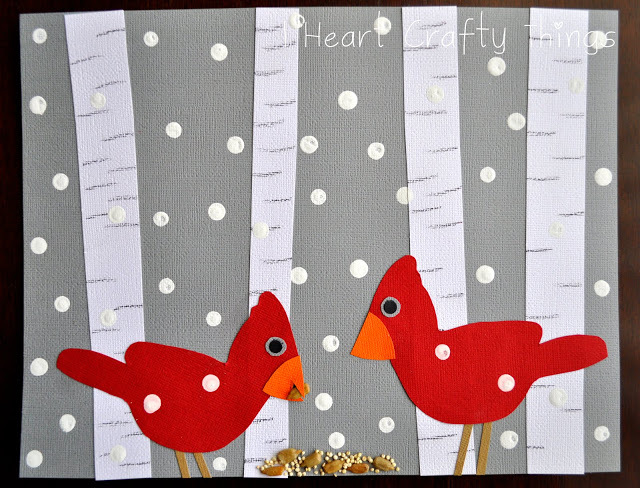 The perfect craftivity for our snowy weather. My 2ndies will love it! I gave it (and your blog) a shout-out on my blog. Please drop by, check it out, and leave a comment when you have time.